Perhaps some of the most colorful and fanciful clothing comes from the Victorian era of the late 19th century. 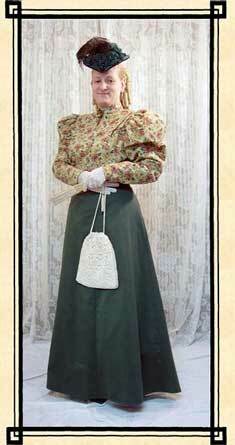 Maybe you are putting on a local play or small town 1800s Christmas caroling and you need this kind of attire. Maybe you are part of an historic site or history theme park and you need to dress the part to give your guests the feeling of being transported back to the Old West or Victorian times. If you want something that is authentic, it is vital to find an online supplier that has men's and women's clothing from this time period. The right supplier will also have many accessory items that are almost impossible to find locally. * Communities with historical museums or a strong presence for historical preservation with a connection to the past work hard to educate townsfolk and tourists alike about how their community was built and by whom. One way to do this is to encourage your whole town to participate in its Heritage Days celebration by dressing the part, putting on an old-fashion ice cream social, and a band concert in the park. * Or once a month, you and your family may wish to turn off the electricity for an hour or so. Shut down all the cell phones, computers, televisions, and radios. Sit in the living room and read or talk to your significant other and re-connect one-on-one as was done in the bygone days of courting. If you choose to enjoy a once-a-month time travel to the past, you may wish to make it more authentic with a few antiques and collectibles around you in the room. It will not be too expensive to invest in some Victorian style oil lamps and perhaps a 19th century story book from which to read. This will lend some authenticity to your special time. In fact, you may wish to make your time travel episodes a weekly occurrence and communicate to your loved ones without any modern technology.